We are Looking for Export Inquiries for our range of Animal Feed Supplements from All over the world. 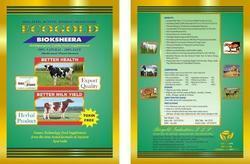 Our Cattle Feed Supplement has a natural herbal extracts composition along with has been developed in house and presented as ecogold bio ksheera. Being natural the product is 100% safe. It is economically beneficial to the farmer and positive result can be seen in very short period of time. The product has not only been tested in leading laboratories but also on lactating animals for efficacy and safety since many years. Helps to increase weight of sheep, goats, bulls for extra meat production. Our manufacturered Cattle Feed Supplement/ Animal Feed Suppliement has a natural herbal extracts composition along with has been developed in house and presented as ecogold bio ksheera. Being natural the product is 100% safe. It is economically beneficial to the farmer and positive result can be seen in very short period of time. The product has not only been tested in leading laboratories but also on lactating animals for efficacy and safety since many years.